Love affairs are bittersweet. There’s the shock and initial giddy rush of attraction that takes you someplace wonderful that you’ve never been or felt before. You overlook your beloved’s peccadilloes, their appearance, their annoying parents. Their beauty grows in your eyes. You rush to their defense, to maintain the miracle of their presence at your own peril. And then, it’s over. They need their freedom. They fly the nest. Your sojourn together is too brief. One day, they’re gazing upon you with their soulful eyes, tucked in a nest of love, and the next, stretching their wings and borne on the wind, they’re off to find the next fragrant blossom. Yes, the hummingbirds are getting ready to go, and I am prematurely desolate. Seduced and abandoned. I knew their departure was imminent this morning when I climbed the stepladder in my nightgown to photograph them (blessedly, the Shrew was still asleep). 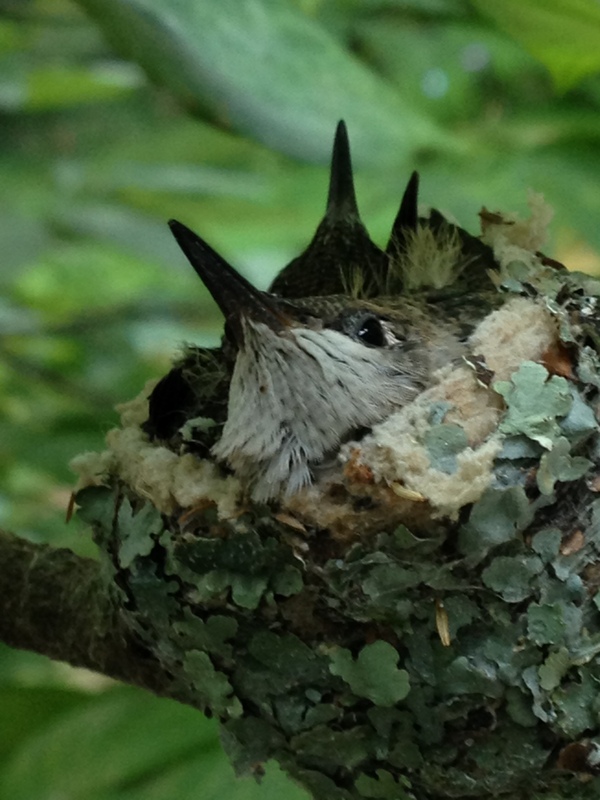 They just looked at me with their unblinking eyes, stuffed into their mother’s love nest with their beaks and tails hanging over the edges. Their heads have grown significantly in the past few days, so that their eyes are no longer dominant. The larger of the two is the size of its mother, so I know it’s time, and I’m just not ready. She is just starting to let me watch her feed them, a miracle all by itself. Too soon, it’s too soon, for me, if not for them. They were silent. Not a peep out of them. 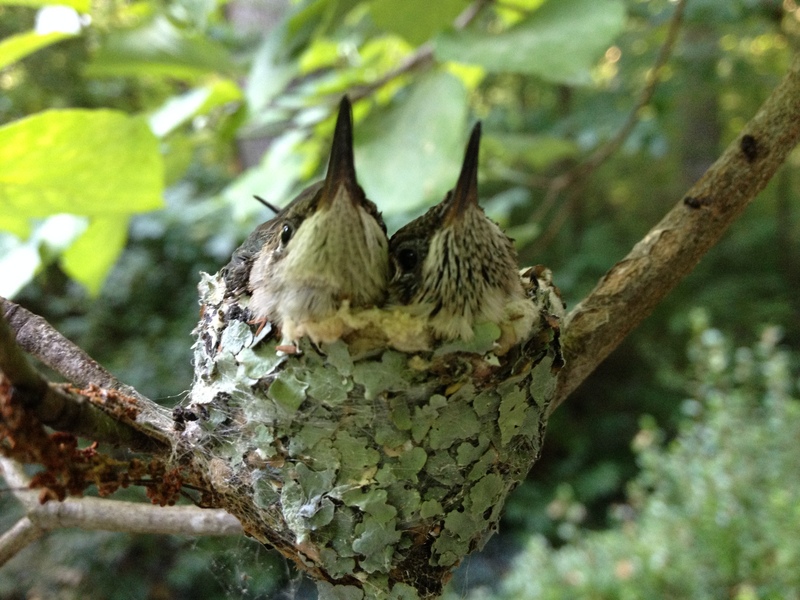 “I love you so!” The nest swayed in the breeze, but they remained steadfast on their branch. Over the weekend, a dear friend lost one of the longest battles with cancer of anyone that I know. Mr. Phil and I were the long-tolerant spouses of avian veterinarians, but he partnered his with much more grace and patience than I partnered mine. My heart was broken from the loss of his smile and laughter and his cool ties and sharp hats. It was also broken for his wife, whose plaintive tribute to him brought back memories of my own loss, brightened by her request that his friends have a Champagne toast in his memory. I fed the BFF and made my morning cup of strong black tea, sweetened and doused with milk (fat free, of course), put her meds in her marshmallow, and settled down to the morning news and my email, which held a delightful surprise for a woman who really doesn’t do mornings. Suddenly, I’ve been thinking about faith, hope, and love in a new light. God tirelessly redeems and redeems and redeems so, who am I to complain? Life is good (mostly). Soli Deo Gloria! 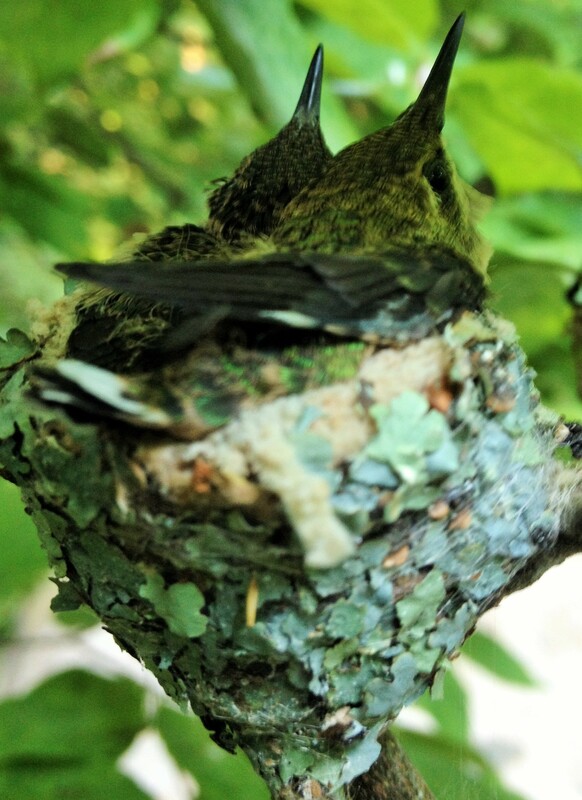 Categories: Faith, hummingbirds, Nature | Tags: Faith, hope, hummingbirds, loss, nature | Permalink.